Vueling launches an Avios credit card in France – but is it any good? In an interesting move, Vueling – IAG’s low cost short-haul carrier – has launched an Avios Visa credit card in France. This is, I think, only the second airline credit card on the French market. 0.8 Avios per €1 spent elsewhere – including cash withdrawals! All in all this is a surprisingly impressive package. You are getting the equivalent of 1 Avios per £1 spent, and on a Visa card. This is even more aggressive than the recent UK launch of the Virgin Atlantic Reward credit cards, and we felt those were rich in the new environment. Interestingly, it is a different balance of fee and reward to the Vueling card launched in Italy earlier in the year – see here. This card has a higher annual fee of €49 but also a higher earning rate of 1 Avios per €1. For anyone who spends less than €1000 per month on the card, the French version is better value (and vice versa). There is no guarantee that Avios would look to replace its current UK cards with something similar, but it is clear that someone believes you can still make money with an earning rate this good. You can learn more on the Vueling website here. I thought that the recent deal for buying SPG points would be the last we would see before Marriott Rewards and Starwood Preferred Guest were merged – but it is back. You can currently buy Starwood Preferred Guest points at 35% off in a new offer – the link is here. 30,000 SPG points will cost you $682.50 (£518). 30,000 SPG would convert into 90,000 Marriott points. This is an excellent deal when you remember that NO Marriott or Starwood hotel will cost more than 60,000 points per night if booked between August and December (stay whenever in 2019). You need to buy via this page before 20th July. PS. This is also a way of buying airline miles in schemes that do not sell miles directly, such as Lufthansa Miles & More. Starpoints transfer at 1:1 to most airlines and you receive a 5,000 mile bonus when converting 20,000. You need to do the maths but buying SPG points at 35% off could work out. The Tesco Premium Credit Card is finally dead! Last week we wrote that the Tesco Premium Credit Card was about to be removed from the market. It didn’t happen, and on Monday we gave an apology because it was still showing as available. However, yesterday, it did finally get removed from the Tesco Bank website. It looks like our source was right all along! It’s not that surprising though: I believe this are more marketing tools other than generating a profit. Also, look at Spain. There are the Iberia cards, but also the Air Europa Visa card, totally free, 0.5 Miles per EUR. And you get free tier on top (Silver, which matches SkyTeam Elite), basically getting free luggage and seat selection when flying Air Europa (even on basic fares). Whatever, don’t believe these cards are there to make money, but rather as marketing tools. The problem with the Uk there’s really no competition in the FF schemes. Avios or Avios (Virgins one is more a niche FFP). I actually think it makes sense for airlines to offer some kind of benefits to credit card holders. Take the free BA AMEX, you could fly exclusively on BA’s rivals and the only time you use BA is when you cash in your avios for almost free flights. Has anyone had their statement for the new Virgin card and received points for purchases through Curve please? What is a warehouse retailer? Oddly there is a MCC code in the AMEX handbook for “Home Supply Warehouse – 5200″… If i were you i would call AMEX to have this defined further however. SPG-Marriott is currently 3:1 so makes sense when aligning to the new program. Not sure what a “warehouse retailer” is – do they definite that in T&Cs? With the Marriott merger the 3 points is to be expected, but why the half points at (presumably) Costco I wonder? Weird rule – presumably something to do with the Amex Costco card? So is that 3 Marriott points or 3 SPG i.e. 9 Marriott points? OT – Cancelled my Amex Plat card and there was a tiny residual amount of MR points left in there. It said they would be forfeited in 30 days…..Will this affect the 6 month wait before i can re-apply ?? You can transfer small amounts to Nectar FWIW, but anecdotally it does not seem to matter. You should have received a letter with the cancellation date on it. No, it does not affect the 6 month rule. Likewise a credit balance does not as well (eg if the card fee is refunded pro-rata). OT what is the cheapest digital download for IHG pts for the Accelerate target. I tried the one that was zero pts a few weeks ago and that didn’t work – what is the next cheapest option? Found a recipe one for 200 pts and 1000 pts instantly credited! OT Hilton Be My Guest Certificates. Mine were due to expire in July and I couldn’t use them but their customer relations team have agreed to extend by a year – superb service from Hilton. Awesome ! Finally an Avios earning card other than AMEX ???? Now I can finally start earning points at places that still don’t accept American Express. And thanks to combine my Avios that means a whole lot more BA Avios in my piggy bank ???? Please let us know how goes your acceptation process for the card, the limit and how you can use it easily every day. That will be interesting to learn from your experience. I will report back once I’ve got it ! So far not so good with the application form crashing every time I send in my details. But finally found a phone number that’ll hopefully get my issues resolved. Crédit agricole is issuing the Carte Visa Vueling. Or more accurately CA Consumer Finance is doing it (in english inside ^^, more modern I guess than the crédit à la consommation, at least they show the Sofinco brand which is still more know for French people). It is a card mandatorily attached to a revolving credit. You probably cannot refuse that revolving credit. This market is dominated by let say three banks only in France despite all the marketing/brands around it. They all work the same way. 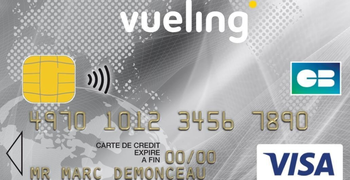 You get a revoling credit and card attached to it, here the vueling card. You can only pay by direct debit. You cannot refuse direct debit. But of course because this is a revolving credit, you will be debited only the minimum and the remaining amount will trigger the interests to be pay monthly on top of your use. I am not sure if you can change that minimum amount to be debited before it is to be debited. You may be able to connect on your internet revolving account to do so but I do not know if it is really possible. You can send an additionnal cheque for the remaining amount but this is a manual process. Transfers/credit card are not an habit for paying the remaining amount in France and never advertised, unless you are declared bankrupted. – expectation you will use them to have an additional loan to buy a car. – for sure people have the vueling card in te wallet and may impress people ? – non frequent travellers may more use vueling instead of easyjet to go to BCN ? Or even use LEVEL to go to Martinique or Guadeloupe ? – this may increase the brand knowledge in France ? BA had in 1998 a visa premier card with Cofinoga (owned by BNP now, which may be the Creation company now in the UK) also attached to a revolving credit. But I am not sure it has worked well because they were no marketing campaigns at that time. And I guess this card does not exist anymore. At the same time, I know someone being refused to have the Galeries lafayette card, not a carte bancaire, just because he was rich enough that Cofinoga/BNP behind it estimated he will never use the revolving facility. And revolving credit have bad reputation in France with the consummer associations and the people in general. Any way you could put that in English we might understand rather than siphoning it off google translate? I appreciate English isn’t your first language but it really doesn’t make a lot of sense here. What – for example – is ‘revolving credit’? ‘Revolving credit’ is an overdraft. Not really an overdraft, I would have thought. It is (or was, when I lived there) common American usage, applied to store cards and the like rather than Visa/M/Card. The idea is that you should always be in debt to the card firm, and there always paying interest. Paying off the full balance, as we do here with our cards, was difficult, or maybe impossible, without closing the account. I would not have been able to explain clearer than you. This is exactly what you write. I understand overdraft is more for current accounts thna for loans but Rob may be right: that maight be the name in the UK. Basically if you have a credit limit of 1000, you buy something for 400, your credit limit is then 600 minus the interest. You pay 10 by direct debit so now your limit is 610 and you can only buy for this amount now. How does it work in the UK? Crédit renouvelable ,in an automatic way, is that. It is a loan first before being a credit card. You have a free to use loan withou futher question inside your limit. You pay nothing if you do not use your limit at all, apart from the fee of the visa card every year. If you use your loan, you pay interests except maybe the first month (I may be wrong even for the first month). Well this is why Rob says overdraft probably. Is this called artificial intelligence? In France you apply for a loan not a credit card, with the exception of Amex. Either you open a bank current account. And you may have some means of payment such as a cheque book or a card. Either you “ask” for a loan and you may have a card attached to it, but not always. That’s the case here for the vueling card. And vueling has put it on ist web site. (You commit to a loan, you need to pay back this loan. So check you are able to pay). It is a loan service. Your deal is with Crédit agricole, not a new-tech payment company. I hope this helps a little bit more. We have similar here in Australia, although standard credit cards are the norm. Generally, when you apply for store finance (via Apple, Fantastic Furniture, or whatever), you open an account to finance the goods at whatever rate. Alongside that, you get a credit limit and a card (a debit card bizarrely, with some) which allows you to keep re-borrowing the amount you repay. They hope you’ll continue to do so, and they can charge you a fortune in interest. The plus side with them here is that the payment platforms tend to accept PayPal, which means you can pay them off using Amex cards. They make no attempt to make it easy for you to repay what you borrow, but it’s possible to use them to your advantage. That’s maybe not the case in France though. As an aside, my understanding of ‘revolving credit’ is any credit you can borrow and repay over and over again, a credit card being a form of revolving credit, for example. Seem to recall Rob recently commenting on ‘Fare Errors’ and the fact/prospect that BA and others would honour the tickets where the differential wasn’t so large as to be ‘manifest’ (as seems to be the case here as the story infers). BA however clearly didn’t feel the need to do that on this occasion! They are saying that it IS a massive differential because of the usual cost of a REFUNDABLE ticket. Technically they are correct. Thanks. Yes, saw this, will drop it in over the next few days. I understand that when Avios closes Lloyds upgrade vouchers will be redeemable over the phone through BA. Is that possible now? My Avios account is an Aer Club linked one, so will presumably stay open. No they are still with avios.com if your account is still open and I think that once it’s closed you’ll have to ring avios.com to redeem it. OT – has anyone had their avios.com account closed and moved over to BAEC yet? There’s been no movement with mine or OH’s account since the original email notifying us of the changes. I can’t get into mine any more. Had assumed it had been moved across. Need to contact avios and find out what’s happened though as my Lloyds points haven’t hit my BAEC account. Might be like someone reported the other day that there was just a logging in problem. I could not login to one of my accounts, but could fetch the points from BAEC. Logged into! Avios account last night and moved Avios over to my BAEC account. OT. Just cancelled my AMEX gold with view to churning in 6 months and securing new signup bonus but was informed by Rep that rules have changed (from February 2018?) and i’ll now have to wait 24 months to be eligible for any sign-up rewards with ANY AMEX rewards cards including Platinum and new Gold Credit Card. cant remember receiving any notification of changes. Has anyone else fallen foul of this “new” approach? My wife and I have received several sign up bonuses since Feb 18 after waiting six months. +1. I’ve also just recently cancelled a gold and a platinum and this wasn’t mentioned. The referral page for BAPP states ‘This offer is not available if you currently hold or have held any other Avios enrolled American Express Cards in the past 6 months.’ the same on Gold and no doubt on all of the others. It wont be the first time an Amex CS adviser is wrong although these Rumours were rife earlier in the year they seem to have stopped now. Or more likely that you got one of the agents in the Pacific and they read the rules that apply to US users not GB ones. I’ve got a large purchase to make a new kitchen, it’s on interest free for a year but wanted to know if anyway I can earn some BA points of it when I have to pay up or pay interest .They don’t accept Amex which was my plan My back up plan is my two Tesco cards I could put it on for points. My plan is to put it on cards for points then pay the cards of with my cash. Am I missing a trick with another card I have plenty of time to apply for one? It might be good to see if you can you pay with paypal. If “YES”, you can link your amex with Paypal. Great I’ll have a look! I haven’t found out if I can use pay pal to pay off Barclays partner finance yet; but thanks for the tip as I can pay for all my new fencing supplies with pay pal as they don’t take Amex and I’ve got 100 ft of new fencing to do! On the premium card, there’s a link to get 15K joining bonus + 3x £15K/ month for first 3 months if you spend £1500/ month – you’re not eligible for this unless you were an existing Virgin cardholder but they still let you sign up for it, worth a gamble for little risk. Want the link? Any Virgin cardholder invited to apply for the new Virgin credit card can get it legit anyway. You won’t get it. The bonuses are being done done manually in Crawley. I know the exact people doing it! You’re not on the list then! That is too far back. They do seem to be contacting people who cancelled a couple of months ago though. I’ve still got the Virgin White card although it’s largely been gathering dust for a long time -though I have used it this calendar year – I’ve heard nothing from them. Am I likely to? Emails are going out over 2 weeks UNLESS you opted out of receiving marketing emails from Virgin Flying Club. If you did, you’re stuffed. Opting it now won’t fix it. Yes please can I have the link? That is a big mistake in my view. I know how they are doing this and you are likely to end up with nothing. The people getting 60k have been specifically selected. I’ve just paid for some roofing work via Billhop on a new BAPP – the Billhop fee was offset by the card sign up bonus plus a big chunk of the way towards a companion voucher so it’s worked for me. Sorry this was a reply to Debs re her kitchen! I don’t think it’s going to work in this case. But I’ve leant something new today as I’ve never heard of billhop before so will take a look at that properly. Do please remember that if you try some of these creative ways of getting a nice chunk of avios, you can lose your section 75 rights if the kitchen firm fails; just as the one my sister used about 18 months ago after she paid some £15K. Fortunately she had paid around £500 on a Tesco Credit Card (I think – may have been AA) and after a lot of foot dragging got a full refund. I am happy to pay someone like HMRC using Billhop, for example, if the payment scheme works for me, but if I am paying cash in advance for goods that should come later, I stick to a straight credit card payment.